The skies were dusty gray yesterday as I drove into Birmingham. I kept thinking that it would rain but it never did. The bed of my truck was full of garbage bags stuffed with plastic. I'd been storing it for months waiting for the weather to break so that I could load it up and take it to the recycle place. I kept an eye on the bags in my rearview mirror. That last thing I needed was to be dashing across the Interstate collecting plastic that had blown out of my truck. Each time I stopped, I cinched the bags tightly and secured them the best I could. Thankfully I made it to the recycle yard with all the bags. The recycling place is huge now. They do metal, plastic, cardboard, and other recyclables. Pulling to the curb, I tossed the bags in the bin and headed for home. The center is located in the industrial section of the city near the train tracks. After pulling out, I turned on 1st Ave and headed toward the city center. 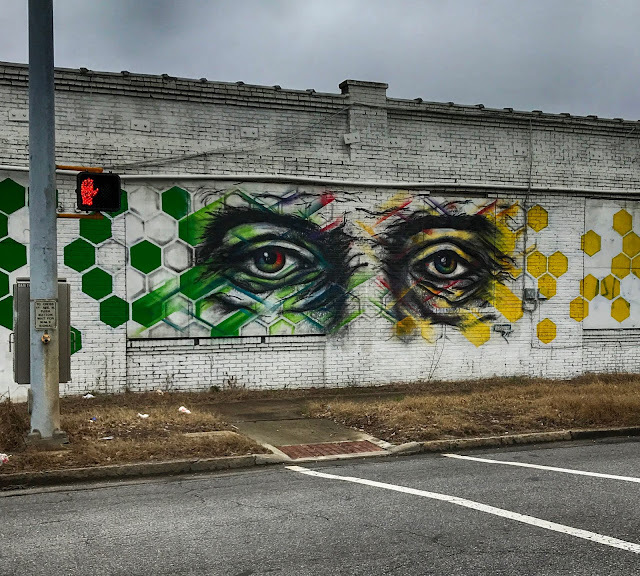 A stoplight caught me and as I sat there waiting for the green, I noticed a wall looking at me. I snapped a few pics. I love that art can make even a dismal place more hopeful. I adore street art and murals and that one is a stunner. I enjoy the art also. Acrtually some of those budding artists are very good. That seems to be very catchy. I wonder if this is aurhorized or midnight grafitti? Appears to be authorized. I like it. Lots of spray cans here! Good for you for recycling. We are recycling nuts but it is needed. We saw 2 young surfer dudes who have started a non profit business collecting garbage, mainly plastic bags etc... out of the oceans. It was just them and now they have 4 boats and many people helping them out. We are going to buy a bracelet from the8r website which will help collect more garbage. Love the street art! Good for yo for taking the time and energy to save your recyclable plastic and taking them to the recycle depot. I hope more people will follow your lead. I love street art too. This is a cool one. It is impressive what can be done to beautify all things available. There is a fine line between art and graffiti. Graffiti can be an early sign of a neighborhood heading the wrong way. Those EYES are art.